I am doing my first ever Product Review and I have to give it 5 stars. 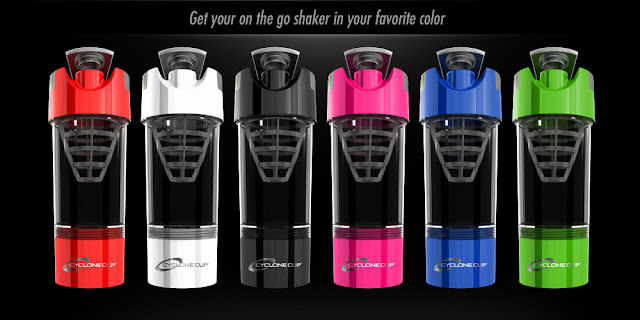 I've been using my Cyclone Cup for a few weeks now and I am uh-bsessed with it. Basically, it's the best shaker cup I've used. I am always going somewhere and that is why I love that the bottom screws off and you can store 1 scoop of protein. This way you can mix it whenever you want! I also love that I can throw it in my purse and don't have to worry about it spilling because the flip lid always seals tight and the lid had a grib on it so its easy to open. One of my biggest pet peeves is when containers don't fit in my cup hold and this one does! It also fits in all the machines at the gym. I checked. I like that I can measure out how much water or almond milk I am mixing with my Vega protein or Vega pre/post workout and it's light weight! If you need a new shaker cup, I highly recommend Cyclone Cup - The Best Shaker Cup Ever! Did I mention they come in sweet colors!? Boot camp - Next Saturday, April 27th! Upcoming dates - April 27th, May 4th, 11th, 18th and 25th at 10:30 am. After some imput, we will just have the one time slot. 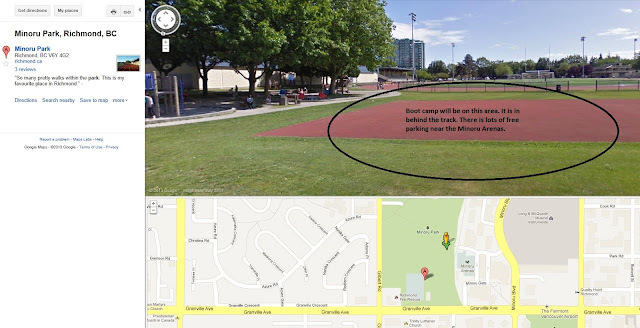 It is based on drop-in at the Minoru Track. Please meet in the middle of the Minoru Track. There is free parking at the field. Drop in is $10. Bring a friend and come have some fun! Since there was some confusion about where to meet and park. I have made it a lot easier. See below. If you have any questions, please let me know :) Free parking is always better than paid.